Writing is usually solitary but occasionally authors get out of that writing space to attend conferences and conventions. This year, I’ve kept my travel calendar pretty lean, but this past weekend (including Monday evening) was different, and a lot of fun. 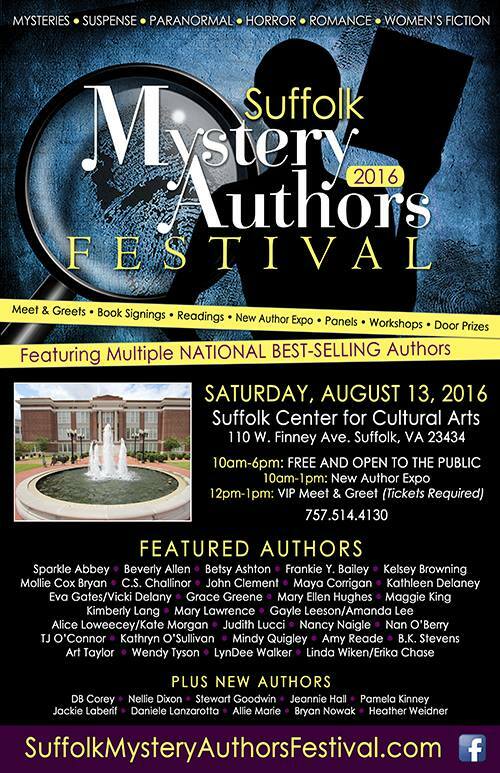 On Saturday I had the pleasure of attending the Suffolk Va. Mystery Authors Festival where a range of genre fiction authors, including those who write romance and women’s fiction, are invited to meet readers, present or sit on panels for workshops, and hold readings. I loved meeting the readers, and also seeing author friends, and making new relationships with both readers and authors. The Suffolk tourism department does an amazing job with this event. It was the third year for the event and I’ve attended two of those years and plan to attend next year as well. I highly recommend any readers who can make it there next August to do so. You won’t be sorry. 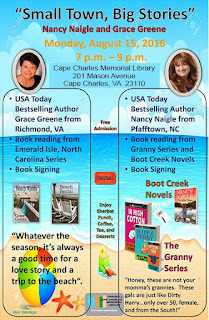 On Monday evening I attended the Cape Charles, VA library speaker series to discuss books. 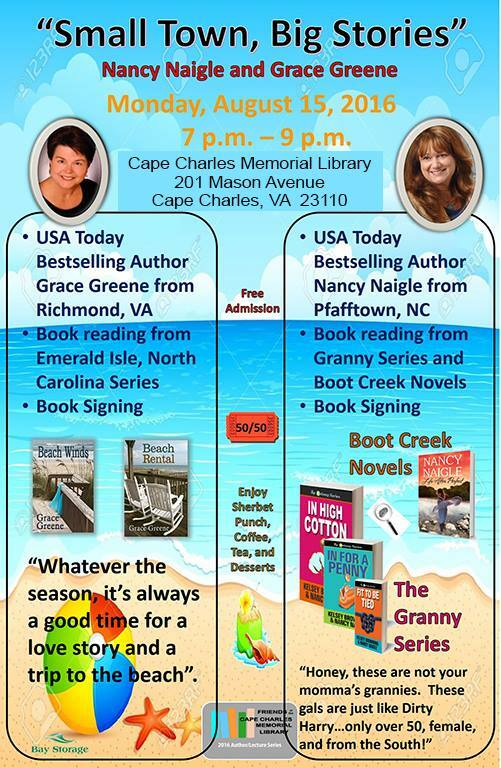 I was there with two other authors, Nancy Naigle and Kelsey Browning. 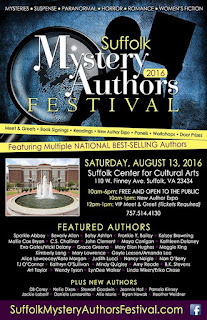 It was a much quieter event than the Mystery Authors Festival in Suffolk, but equally delightful. 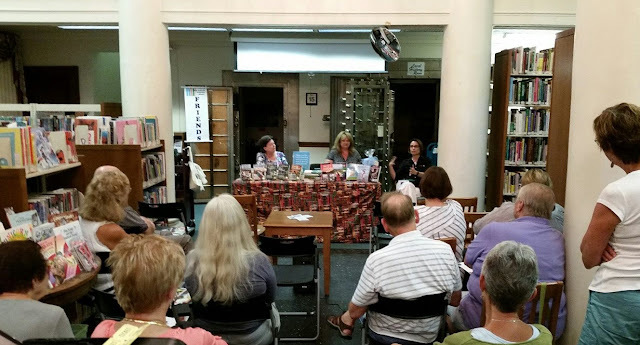 Small can be nice, too – in fact, it was cozy and congenial and I had a great time discussing books with the readers. Usually readers meet authors via browsing and reading their books. When we have the opportunity to go to the readers and meet them in book-filled environments, it’s a special opportunity and I was glad and grateful to be able to participate. Now, I need to get back to writing! Always delightful to meet our readers and other writers, Grace. Sounds like you had a fun time. I had a blast. It was a fabulous day of being with other writers and dedicated readers. Hard to imagine it being better. Vacations and family are so important! I hope you will be able to attend next year. I will definitely be there. 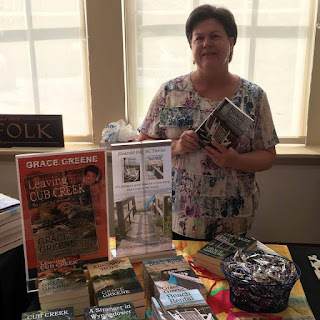 Grace, thank you for letting us vicariously enjoy the reader-author events with you. I'm glad you had such a good time! As with most introverts, events like that can be exhausting, but this one, while tiring, is different. It's so beautifully run and everyone is so congenial and helpful that it's a pleasure to attend. Same here. It was great. And twice, no less! It is fun to meet with readers. It is. RT is good but so large that it's easy to get lost. Sometimes the smaller events are so much more personal and fun.